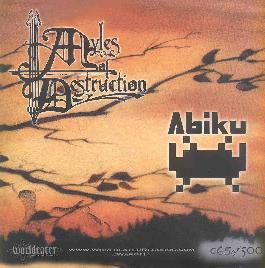 Myles of Destruction/Abiku Split 7"
This is one of the latest releases on the World Eater non-profit record label. All the CDs are $5 and 7" records $3 including postage! All the bands on the label seem to push the musical genre they are categorized in whether it be punk, death, metal, industrial, stoner or bluegrass. Abiku is female vocals (Jane) and synthesizer and programming (Josh). The music is dark industrial inspired by the early 80's stuff by Throbbing Gristle and that genre. Potent screaming vocals and potent lyrics but often difficult to understand. Dark stuff. Myles of Destruction create a sort of bizarre dark horror music. Drums, bass, violin and vocals. This is scary stuff and the lyrics are as dark as the music. This is not stuff for children and only recommended to hear during the daytime, never at night or alone. It is too dangerous. Beware.